Complete kit includes only premium matched parts from Japanese OE/OEM manufacturers. These are the same parts used and trusted by Subaru, Dealers and Technicians world-wide. Perfect Fit, Quality and Durability. This kit meets or exceeds original equipment specifications. All Non-Turbo / 2.5 Liter / SOHC 4 Cylinder Models. Includes The Following Brand New Parts. Hydraulic Tensioner with Tension Roller Assy. More Timing Belt Kits Available. Subaru Outback Timing Belt Kits. 2007 Subaru Outback Timing Belt Kit. 2006 Subaru Outback Timing Belt Kit. 2005 Subaru Outback Timing Belt Kit. 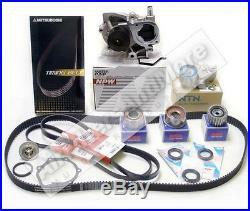 The item "Subaru Outback Timing Belt+Water Pump Kit 2006-09 2.5L" is in sale since Tuesday, November 06, 2012.